Funeral programs and stationery should be reflective of the deceased’s life. Death care professionals should recognize that client families no longer will accept limited, generic and pre-printed options. Funeral programs and personalized funeral stationery are a wonderful addition to any funeral or memorial service. Providing client families with the option to choose from hundreds of themes can set not only the funeral program apart, but your funeral home as well. A family mourning the loss of a loved one strives to create a service filled with memories and fitting tributes to honor and remember the deceased. Client families are looking to create funeral programs, keepsakes and other funeral stationery that visually speaks to them about their loved ones life. If Dad was a nature buff or Mom was into photography or worked with computers, families want ways to be able to express those qualities graphically in their funeral programs. Including the exact things that made their loved one special makes for a truly memorable life celebration. Having generic stationery and funeral programs in this day and age is unacceptable. Pre-printed funeral stationery definitely cannot offer the options and reflect the individuals unique qualities. Thankfully funeral software and funeral stationery is progressing along with client families needs and wishes. Funeral programs and other funeral stationery can now be created using hundreds of different pre-designed and pre-formatted templates. Taking blank stock, a laser printer and some easy to use print-on demand software, death care professionals are able to create a funeral program that reflects the interests, hobbies, occupation or religious affiliation of the deceased. Using the most robust funeral software program that allows death care professionals to provide not only affordable and easy to create options, but also imaginative funeral programs is an ideal solution. Plus, when other funeral stationery. such as funeral register books, memorial folders, prayer cards, book marks, dvd packaging and funeral candles are created using this same software, the overall finished presentation of keepsake items is remarkable. 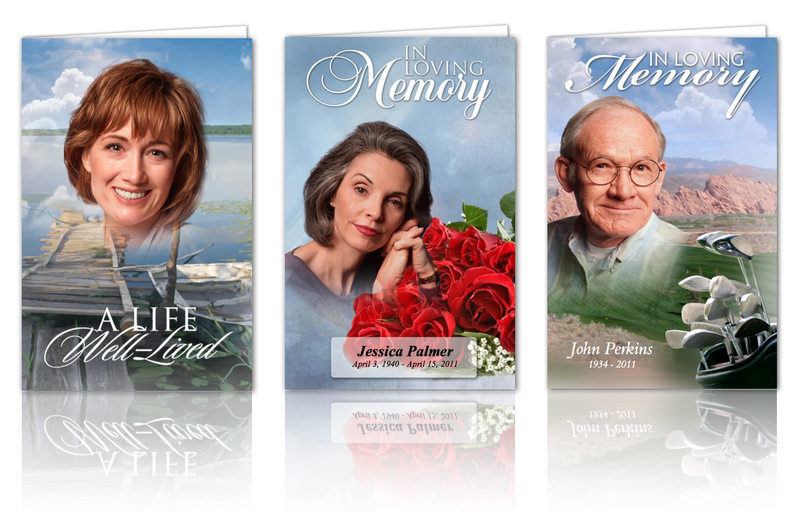 Each life can be celebrated for the specific qualities that made them special using unique, personalized funeral stationery.